Theatre is elastic. Even the notion of human co-presence, audience and performers, gets dissed this week. An article, reference below, posits dispensing with actors altogether. So too the elasticity of this site, which follows representations of and by Wales in motion, word and sound. An article by Mark Damazer in the current edition of Prospect Magazine lauds the superiority of radio over television in covering these fevered times. So it was radio that went out to sample the voices of the nations that make the “United” in the United Kingdom. “So Many Different Little Corners” lasts just 28 minutes but Misha Glenny is a reporter of the first rank and his programme is a good one. “Coming from the south we think you're one big lot, the Scots”, says Glenny. 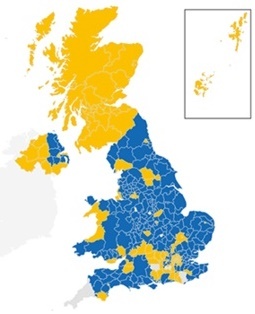 “But it's more complicated than that, isn't it?” Edinburgh and Glasgow are different. The Glaswegians are called “soap-dodgers.” That is, they don't wash. The larger part of the 28 minutes is given to Ireland; indeed Wales gets just 5 minutes. The emphasis given to Ireland is understandable. The border was formed in bloodshed with an irony that the most Welsh of Prime Ministers signed it into being. Glenny visits the gift shop in Dublin's Post Office, the site of rebellion, and comments on the commodification of history. His interviewer describes the sheer ineptness of the government of Britain in turning the men of 1916, a small minority, into martyrs.